The Staff Enchanter, found in Tel Mithryn, is used to create enchanted staves. It is initially located behind a locked door, requiring you to first complete the Reluctant Steward quest in order to gain access. The Staff Enchanter does not require the Enchanting skill, but still increases the skill when used. In order to create an enchanted staff, you must possess an unenchanted staff of the type desired (unenchanted staves may be purchased from Neloth), know the spell with which you wish to enchant the staff, and possess enough heart stones needed to enchant the staff. There is no requirement that you be able to cast the spell you wish to use to enchant the staff; merely having read the spell tome for it is enough. Not all spells can be enchanted. For details about which spells can be enchanted and what the requirements are, see Staves. 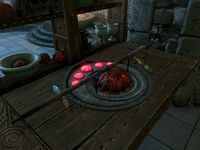 The Staff of Sheogorath can be crafted here as part of the Staff of Sheogorath Creation. The enchanted versions of the Arm of the Moon and the Arm of the Sun can be crafted here as part of the Arms of Chaos Creation. Put A Fork In ItCC: Pass Sheogorath's trial to earn his staff. A Staff Enchanter can also be found at MyrwatchCC, with the added advantage that it can be accessed after only a short introductory quest without ever having dealt with Neloth.